Okay, all jokes aside, Columbus is strawberry jam-packed full of places to pick up your morning coffee and donut. 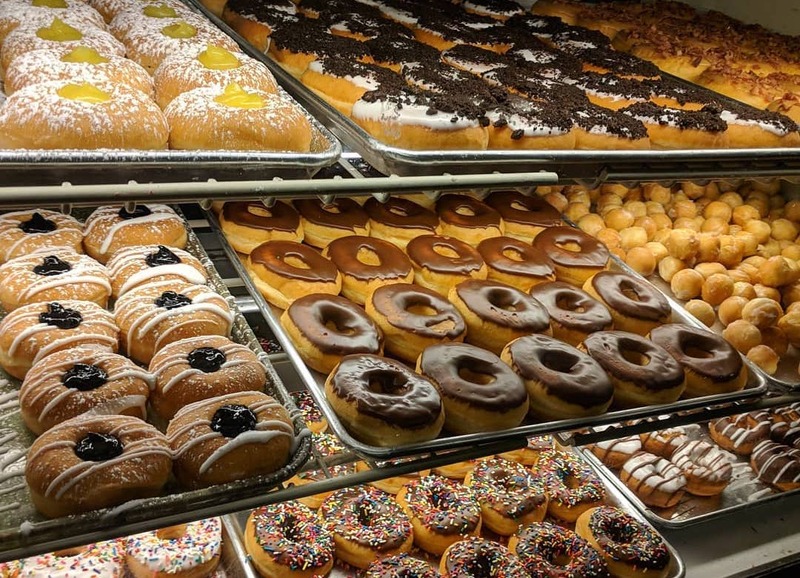 Just for you, we’ve created a compilation of the top 20 donut shops. If you live in Columbus or are thinking of moving into the area, get ready to switch up your morning commute so you can start checking these locations off your list. 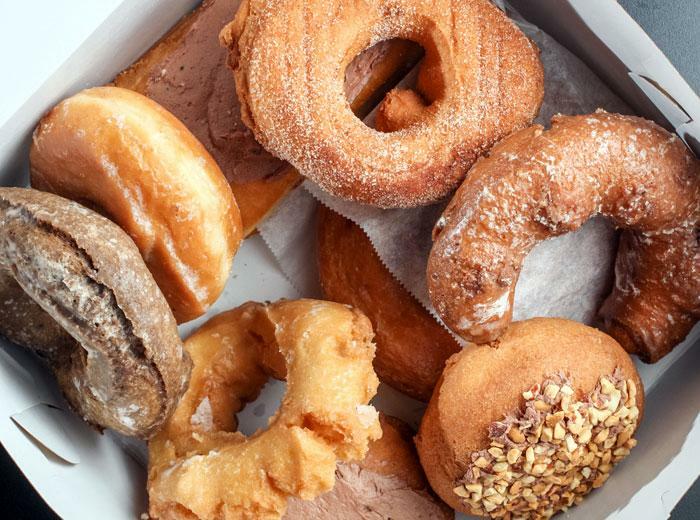 This trendy donut shop puts a focus on fun toppings (in case you couldn’t tell.) 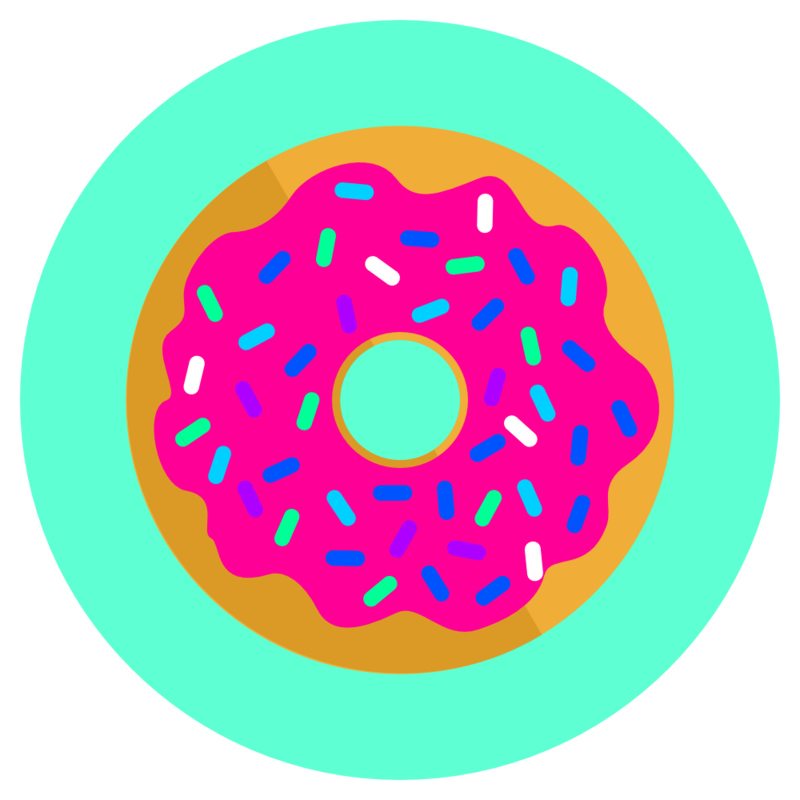 Some of the donuts you should try are the Marge Simpson Sprinkle and Over the Rainbow. They serve coffee as well and because they’re all about having fun, they allow schools to have field trips at their locations. P.S. Their website is WILD! Exploring it was the most fun I’ve had all week. Well done, Amy’s Donuts! WELL DONE! Try the German Chocolate Glaze! Schneider’s Bakery is a family owned establishment that has been baking cakes, cookies, breads, pies, donuts, and more for over 60 years. Their donuts are sold for under a buck a piece, or around $10 a dozen. If you like a challenge, they make these 10 inch glazed donuts the size of the small planet you can bring to a party...or eat all on your own. 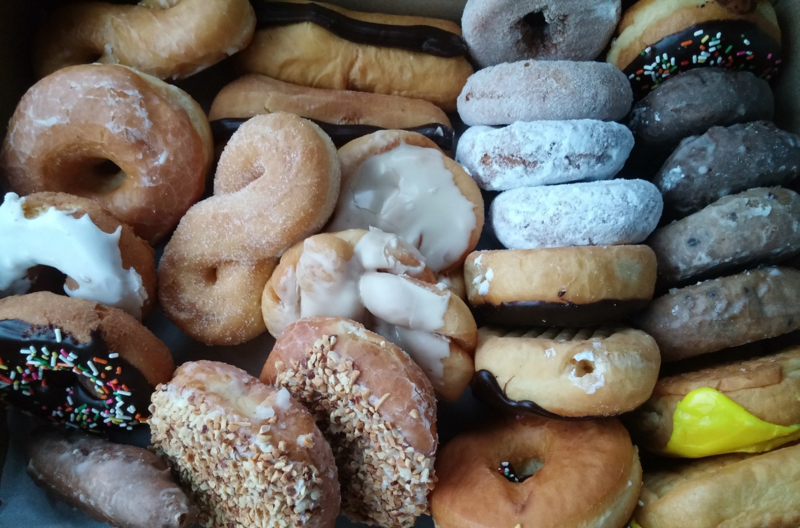 “Feeds 20 people?” Pssssh… My love for donuts is equivalent to 100! Deemed “Columbus, Ohio’s Favorite Bakery Since 1912”, you know Resch’s Bakery HAS to be better than good. And they are. They’ve been making holiday, wedding, and specialty cakes for any event for more than 100 years. 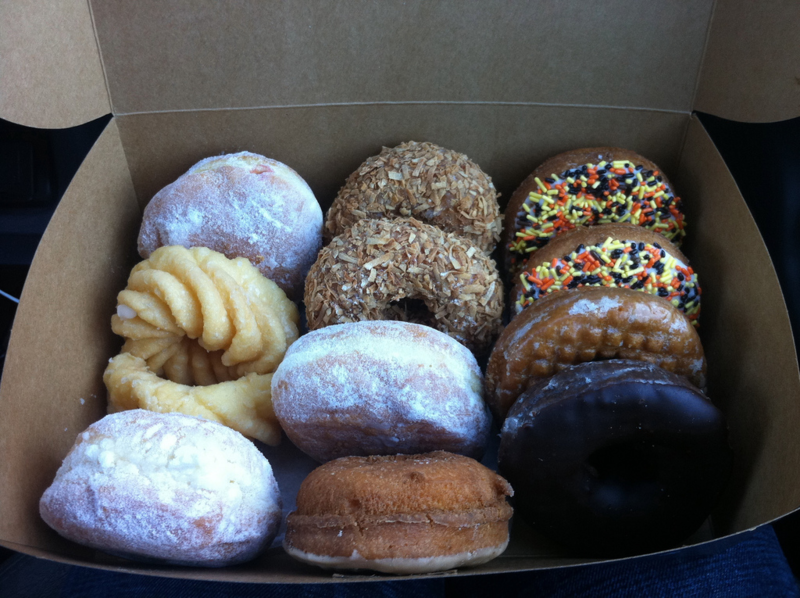 As for the donuts, they sell an assortment of yeast raised and cake, smothered in a variety of glazes. 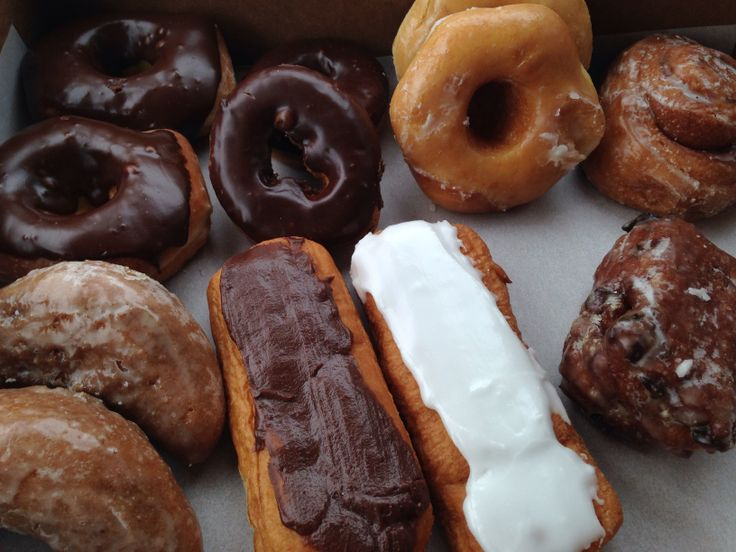 If you want an old-school donut done right, check out Resch’s! At The Original Goodie Shop, there’s no doubt you’ll satisfy your sweet tooth and discover some new favorites along the way. You MUST try a chocolate glazed cream-filled donut and maybe like 10 of their cinnamon sticks. Seriously, those guys are their number 1 seller. They’re akin to the center of a cinnamon roll - sugary, buttery, and heaven in a pastry. 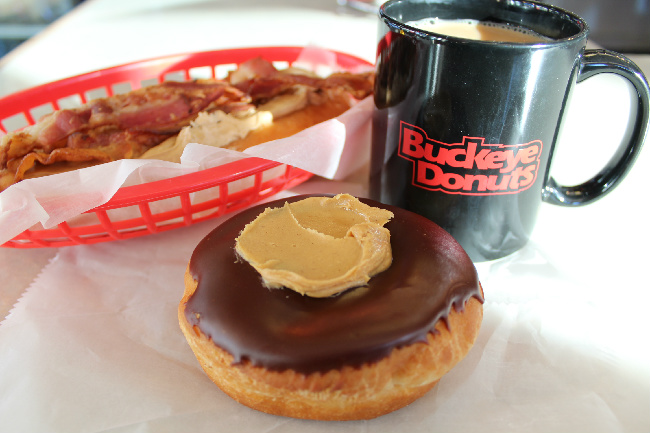 You can find Buckeye Donuts in the heart of Ohio State University’s campus. The shop is open 24 hours to make sure all those college students remain fueled by breakfast and hot coffee. 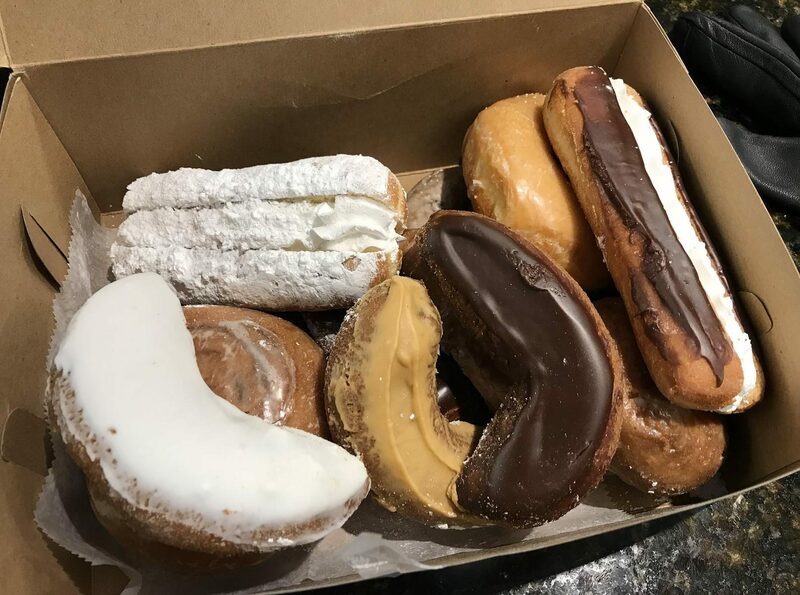 They have 32 kinds of donuts including coconut cake, bowties, and of course, the famous buckeye donut frosted with chocolate and peanut butter! HoneyDip Donuts used to be a donut only joint, but then they added “& Diner” to the end of their name. Although they now serve other breakfast foods like omelettes, donuts are still the focus. 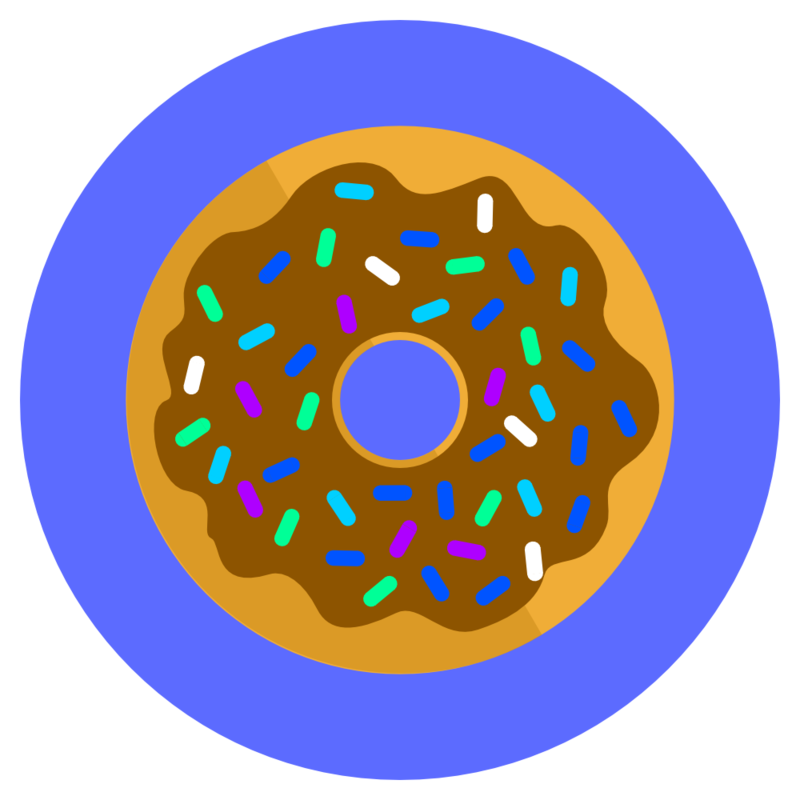 Want to advance yourself in the donut game? Get the donut breakfast sandwich - sausage, egg, and cheese sandwiches between 2 honey dipped rings of fried deliciousness. It may or may not be life changing. 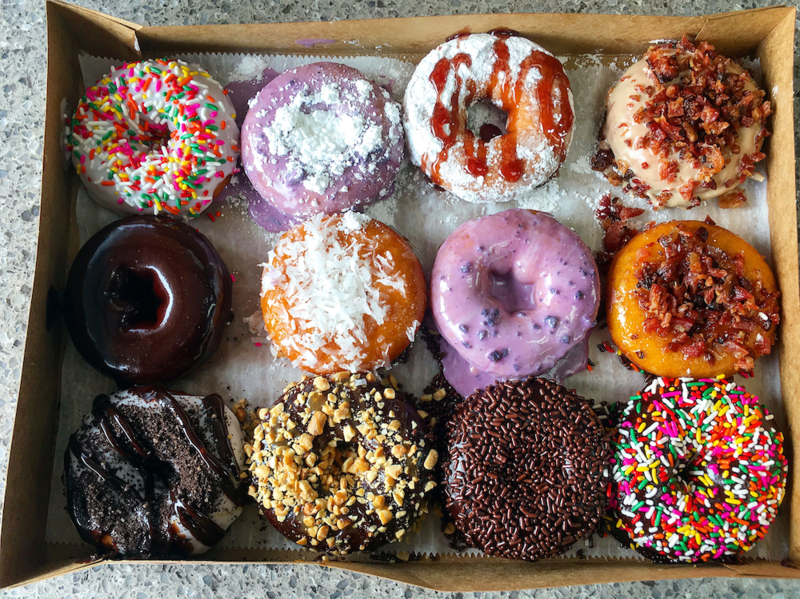 Destination Donuts is another joint that’s super creative and extravagant with their flavors. Ever wanted to try a raspberry hibiscus or maple sausage donut? Or chocolate ganache oreo… or blood orange dark chocolate? Of course you have. And you will. And you’ll love them. Just be warned! Their flavor offerings change daily so you won’t know what’s for sale until you walk in. Open 24 hours, Jolly Pirate Donuts is a small cafe that’s great to stop by on your way to work. They offer a fresh selection of all types of donuts. 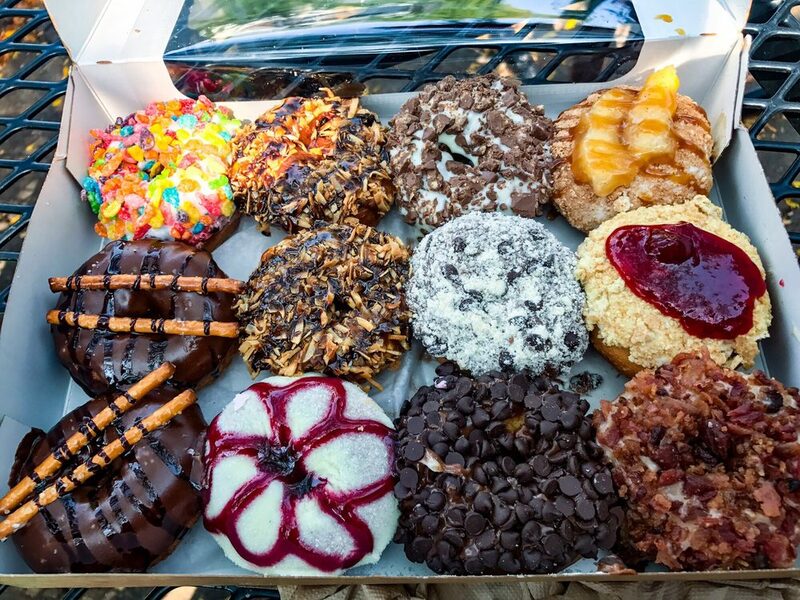 People have been going to the Jolly Pirate since they were kids and can attest this place is worth the trip.Plus, if you want to be the hero of your house or workplace, order a box (designed like a treasure chest) to participate in Operation Donut Drop! Deemed one of the gems of Columbus, Golden Donuts & Diner is a cute little spot with classic decor, perfect for ordering a meal with friends. 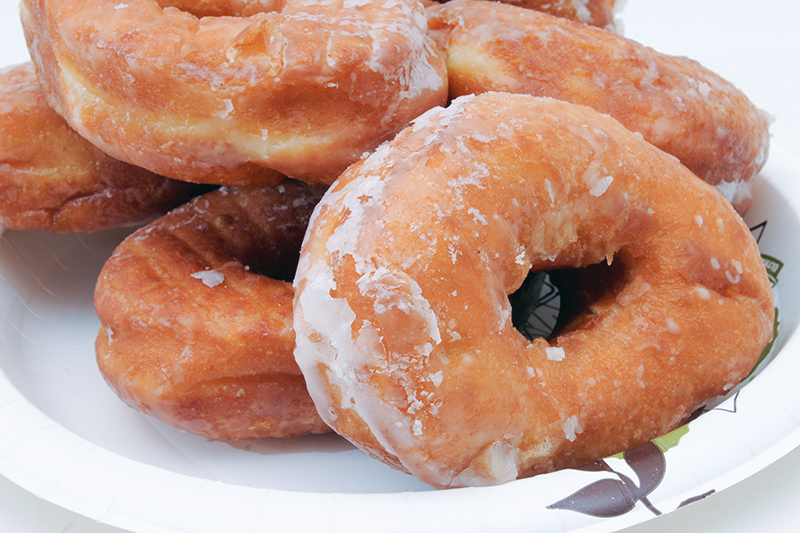 If you don’t want to sit down, just come inside to order a donut to-go at the counter. Some of their donuts don’t have holes and resemble the tops of muffins. Does that mean you’re getting more dough for your dough? We think so. 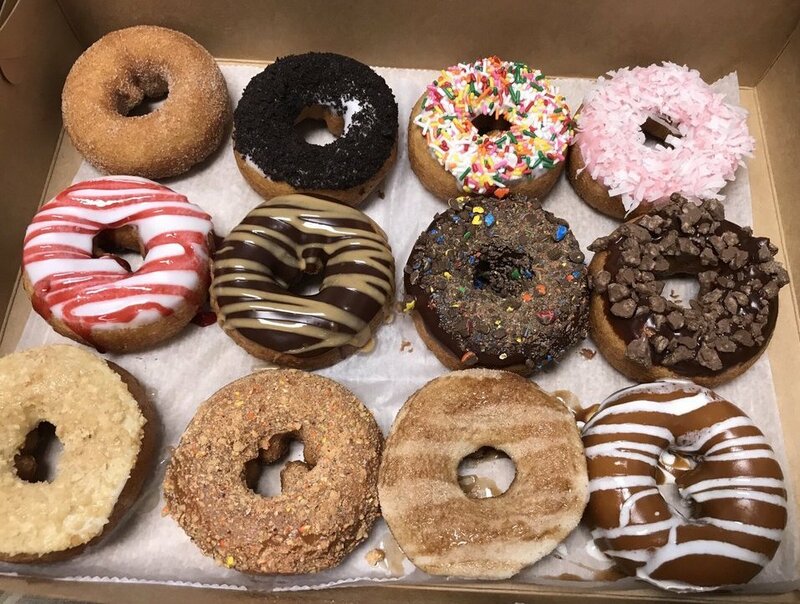 Duck Donuts originated in Duck, North Carolina, and now they have multiple locations across the country - one of them being Westerville. 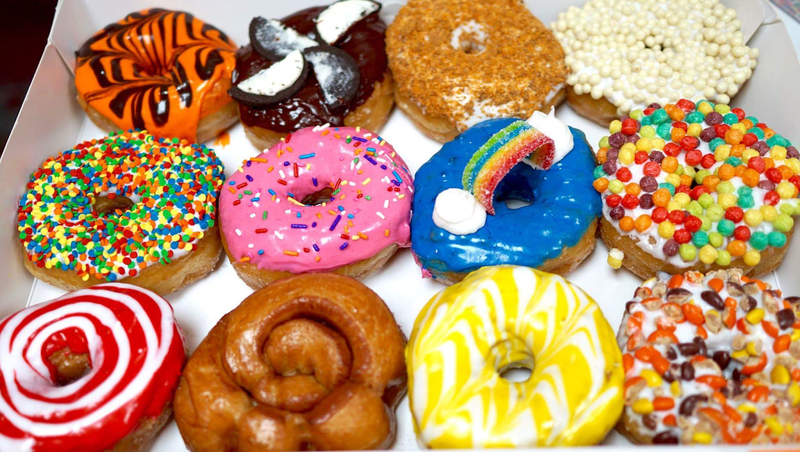 Each donut is made to order and looks like a tiny work of art. You can choose from “featured” flavors, or create your own. S’mores is a fave - glazed in chocolate, rolled in crushed graham cracker, and drizzled with marshmallow. Personally, we’d go for one we invented called the H.E.R. Ask for vanilla icing, rainbow sprinkles, and hot fudge drizzle. 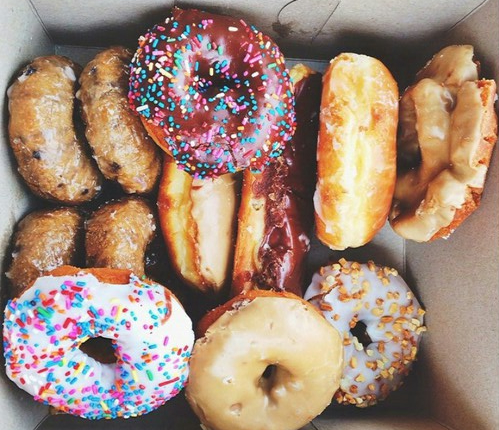 Ever wished you could get a box of donuts delivered to you? Well, now you can. Tupelo Doughnuts has 2 vintage trucks that sell and deliver donuts. Their names are Tup and Tilly. They want to bring you hot coffee and a brown-butter hazelnut old-fashioned donut. Warning: these sugar pastries are so delicious Tupelo usually sells out around 10am. The Lil Donut Factory is located in a small town, but it’s a big deal. They typically sell out of donuts early on almost every day. This shop is hugely popular in the Columbus area, and they deserve it. 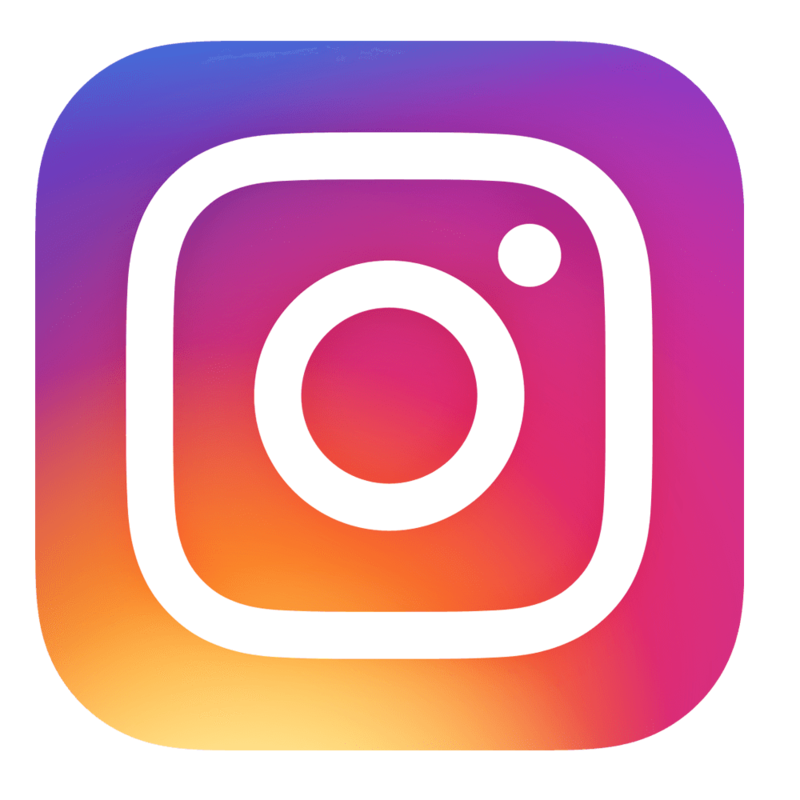 Their donut flavors are creative, crafted with care, and practically made to become Instagram famous. My Old World Bakery is an old fashioned shop that keeps early hours and bakes every pastry you could think of - breads, rolls, cookies, cakes, pies, and of course, donuts. Their donuts are fresh, hearty, flavorful, and sell for the extremely low price of 60 cents a piece. For those with gluten or nut allergies, Cherbourg Bakery may be considered a miracle shop. Their team bakes everything fresh daily and it is always gluten, nut, and dye free. 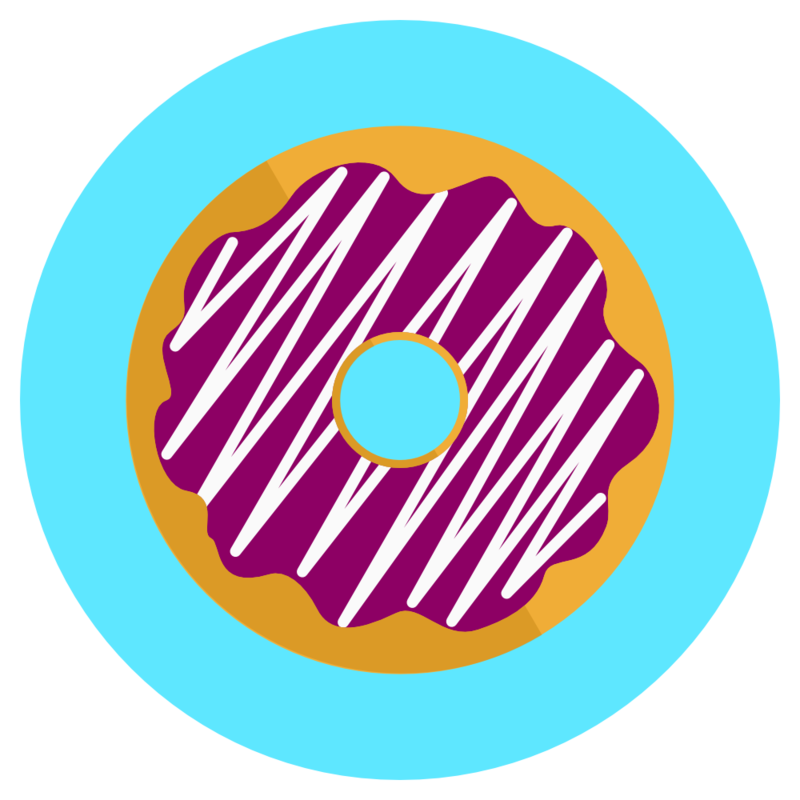 Not only do they sell delectable donuts, but there are a number of sweet and savory treats you should try. DK Diner is a very popular place to order up some quality comfort food in the Columbus area. Oh, and their donuts are famous. They might not be decked out in colorful glazes and crazy toppings, but their simplicity actually makes them taste even better. Plus, they created this breakfast hybrid called a “doussant” - a donut/croissant combination. Order it and let us know in the comments what it was like! 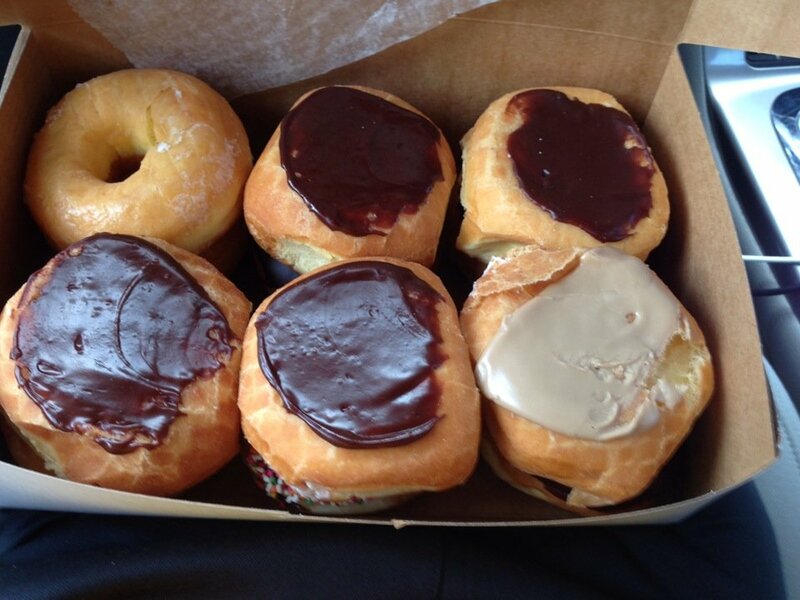 “This place has the best donuts EVER!” - an enthusiastic Yelp reviewer. Auddino’s Italian Bakery has been around for generations and is rivaling Resch’s for the title of best bakery in town. They make really delicious standard flavors, like chocolate or maple glazed. 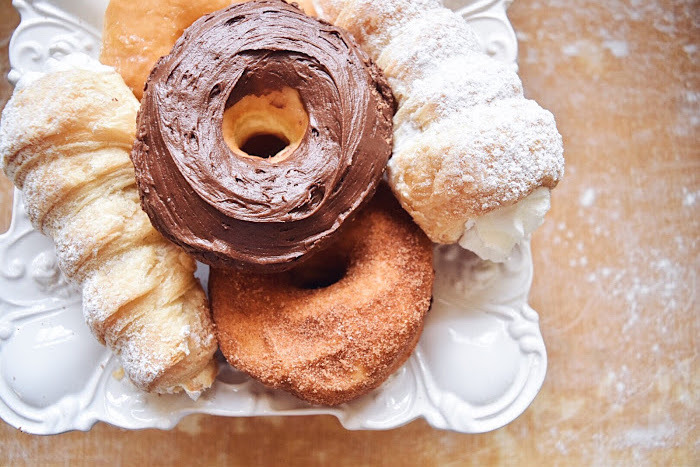 We recommend you order an apple fritter and cannoli along with your donut. 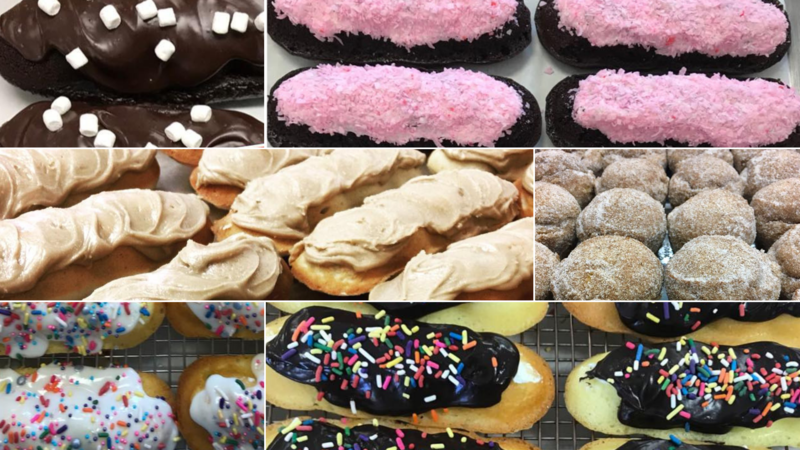 Yum-ee has DOZENS of types of donuts to pick from so there’s no way you won’t find something you love. They’re quite popular with the locals and have a cute old school feel. 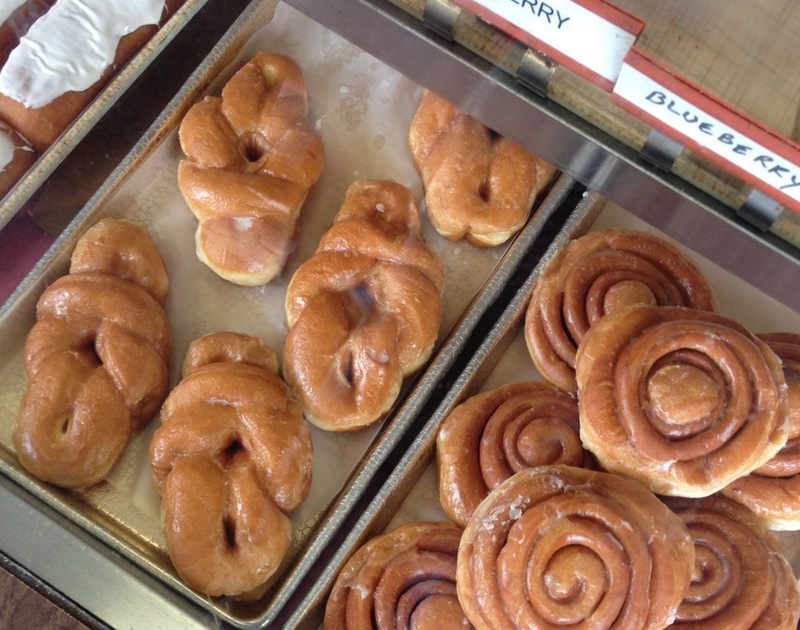 It’s bound to become a go-to place for a morning treat. Just keep in mind that they close by noon every day so you’ll have to buy these for breakfast, not dessert! GLUTEN FREE GOODNESS FOR EVERYBODY! 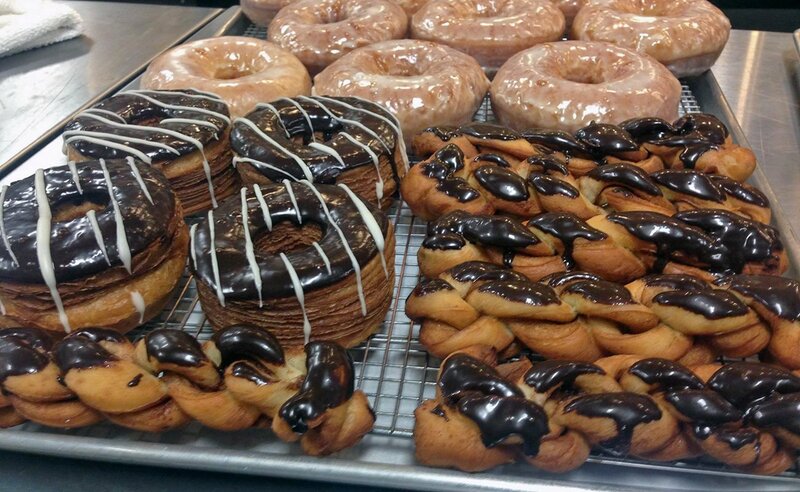 Bake Me Happy isn’t a donut-only pastry shop...and that makes them even more awesome. They have a rotating menu that changes daily with so many unique sweets you won’t believe they’re actually gluten-free! Their signature item is the oatmeal creme cloud cookie, which is available every day. We also suggest buying one of their “spongies” and a donut muffin! 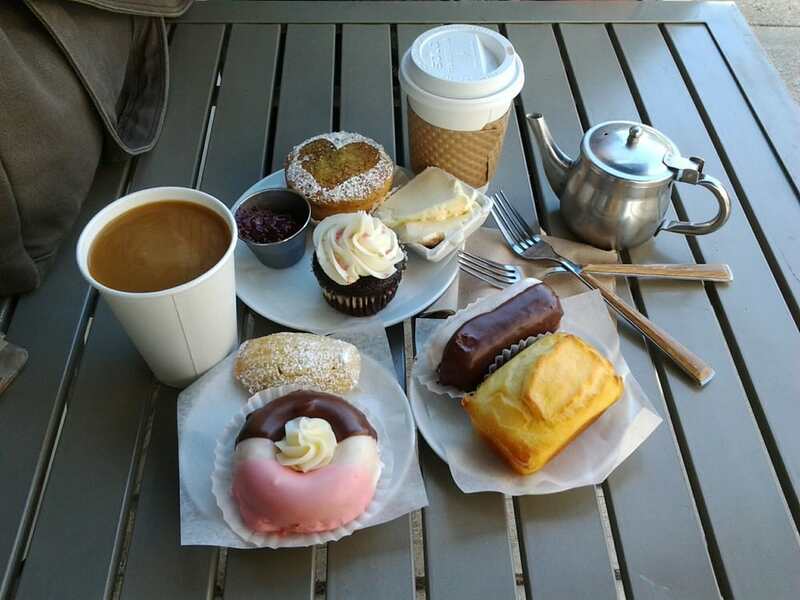 Have you tried any of these pastry shops? 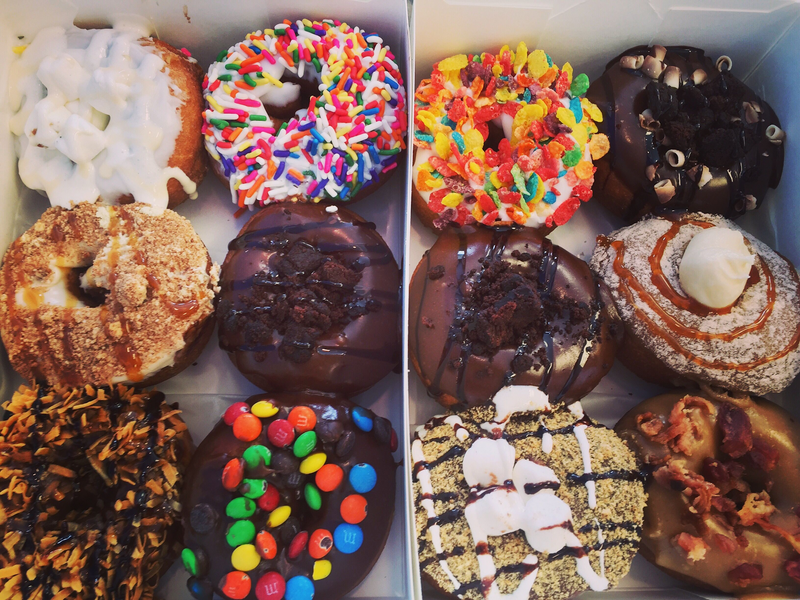 Let us know in the comments which spots are your favorite and which donuts we should order on our next donut dive!